Best friends Lee Jones and Joan Lee have a lot more in common besides their names. On the eve of their big class trip, they each learn their parents are getting divorced. Ugh. The class trip is a dud, so Lee and Joan steal away to talk. 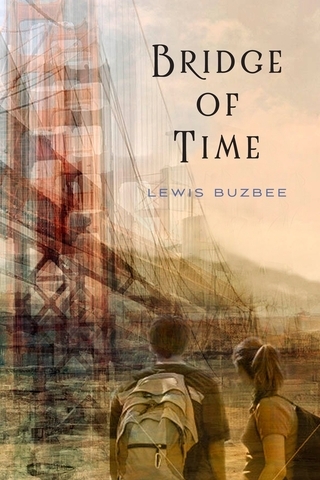 What follows is an afternoon nap in a lighthouse, walking up to find the Golden Gate Bridge gone—gone!—and meeting a young man named Sam Clemens, who is on the run from a mysterious stranger. Lee and Joan wonder: Where are they? What year is it? Why don't their cell phones work? How will they get back? Do they even want to? Will life ever be the same? An adventurous, fast-paced field trip to the past with a memorable travel guide." "An engaging time-travel mystery. With a clever premise and a good-natured narrative, this novel will please both mystery and historical-fiction fans--not to mention general readers." "Readers might even be enticed to pick up one of Twain's classics after reading this novel." "This hybrid novel melds history, mystery and adventure into an imaginative and thought-provoking whole. It offers commentary on the power of friendship to deal with life and optimism to embrace past, present and future." Joan knew where she was; she and Lee were in the Fort Point lighthouse on the worst field trip ever in the entire history of bad field trips, and on the worst day ever in the history of, well, history. The fog that had shrouded San Francisco all morning was gone, the sun blazing. The lighthouse was no longer toasty, more like pizza-oven hot. Lee stood with his back to Joan, staring out the lighthouse windows. Even though she could not see his face, Joan knew he was smiling. Lee often smiled with his whole body. "You've gotta check this out," Lee said without turning around. "It's beautiful." Joan pulled herself up and joined him at the windows. They were looking east, towards the city. The sun was knife-sharp, the bay sparkled blue-green, and the hills were golden. It was beautiful, Joan saw. But very wrong. There was no city where there should be a city. Where there definitely had been a city that morning. Instead, in the distance, only a scattering of squat buildings, and plumes of black smoke rising into the sky. No skyscrapers, no traffic-jammed streets. No city. Her first thought was, earthquake. There had been a huge earthquake and San Francisco had burned to the ground, but she and Lee had fallen asleep and missed all the commotion. Or maybe she was still asleep. No. She was awake and she knew it. She didn't need to pinch herself. The goosebumps she felt, the air in her lungs, the solid floor under her feet, all told her she was awake and the world was real. The sky above her seemed more than real. "Have you ever seen anything like it?" Lee said. She pulled him to the ocean side of the lighthouse and pointed to the sky. "I know," he said. "It's awesome." "The bridge," she said in a whisper. "The Golden Gate Bridge is gone."